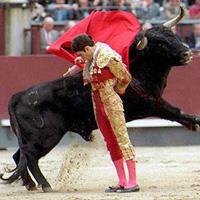 Do you like the world of bullfighting? Who do you consider to be the best bullfighter in history? Bullfighters go through different stages in their development, depending on their experience. In the first stage they are a novillero, or apprentice matador, and they fight young bulls or heifers as these animals are smaller and not as strong. Generally, apprentice matadors start out in festivals that don't include horses. Then, depending on how well they do, they move on to fights with young bulls and picadors. The second stage is that of the matador, where the fighter has sufficient ability to master all the stages of the bullfight with style and technique. In theory, when an apprentice has the sufficient skill and merit to become a matador, he or she executes a special ceremonial fight called "alternativa."